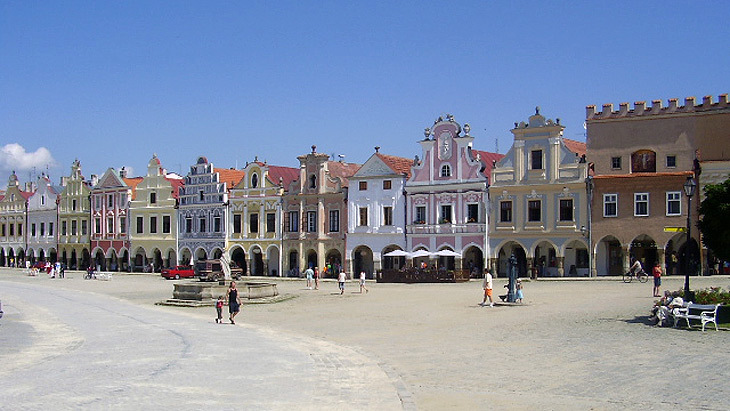 The lord of the area, Zachariaš of Hradec, had it reconstructed after a massive fire damaged most of the town - it became a unique complex of intact historical houses in Renaissance and Baroque styles with a dazzling variety of facades. He also had his monumental chateau rebuilt in the Renaissance style with an English park. Another striking feature of Telč are the crystal clear fishponds surrounding the center of town on three sides. Today you can spend an hour or town paddle boating on the Štepnický pond which is a wonderful way to relax during your visit of this fairytale town. It offers not only a parade of multicoloured houses but also arcades of little shops and cafes where you can enjoy the restful atmosphere of this town. Other interesting places to visit are within cycling distance of Telč, you can visit Roštejn castle or take a train to Slavonice, a small town close to the Austrian border. Today, the town is famous for its cultural events; many music festivals take place here. Being a part of UNESCO world heritage, this magic town is definitely worth a visit when you are travelling in South Moravia.